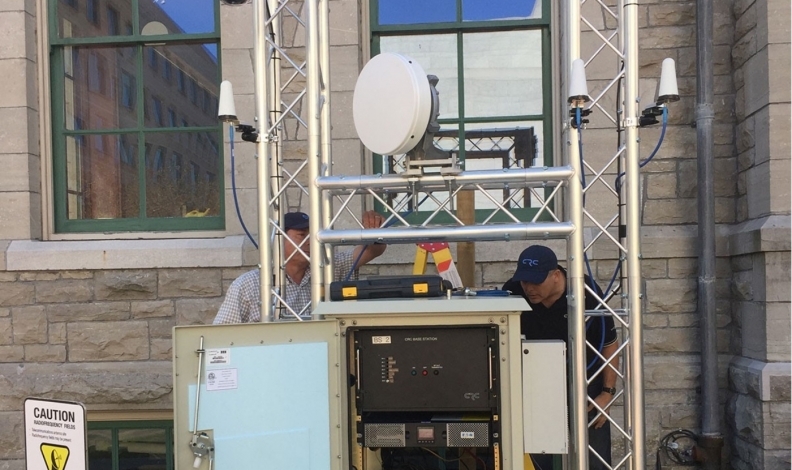 Technicians work on the 5G test tower outside Ottawa City Hall. OTTAWA — The next great thing in connectivity stands on the lawn at Ottawa City Hall, just metres from the downtown traffic. For now, the cars edging by are immune to the signals emitting from the antenna-laden tower. But soon they and every other nearby object could be linked through those 5G radio waves, constantly exchanging information. How soon? Even the keenest technology watchers cannot say just when the fifth generation of wireless technology will sweep up cars and all else — coffeemakers, nursery incubators, mining drills — into the much vaunted, if awkwardly named, Internet of Things. And don’t expect the auto industry, with its long development times and justifiable emphasis on reliability and safety, to be an early adopter. But an eventual 5G-auto marriage seems certain. “Virtually all of the car companies know which way the winds are blowing, know the disruption is coming, and they’re getting ready for it,” said Barrie Kirk of the Canadian Automated Vehicles Centre of Excellence, an Ottawa consultancy. It isn’t just 5G’s ability to move vast amounts of data quickly that sets it apart from previous generations, for which the largest application has been cellphone networks. Rather than routing all signals through towers and switching servers, 5G devices will be able to connect with one another directly or through small, simple reflectors. There’s a big payoff for drivers, even as cars move closer to full autonomous capability. “What if I could livestream video from my car to your car and we’re separated by a huge 18-wheeler,” said Jaco du Plooy, head of technology at Ericsson Canada. “So now you don’t need to actually be able to look through that 18-wheeler, you can get the video of what is happening in front of that 18-wheeler. The federal Communications Research Centre set up the Ottawa tower in 2017 to test the higher frequencies where 5G has the most benefits, and Bell Canada and Telus are conducting their own trials. But the biggest boost will come through a $400-million test project across Ontario and Quebec, funded by the federal and provincial governments and tech firms Ericsson, Ciena, Thales, IBM and CGI. “We’re actually going to build infrastructure and connectivity so it is a real corridor that you would be travelling down, a real 5G physical corridor,” said Ericsson’s Canadian president, Graham Obsorne. Ford is among the first automakers to publicly embrace 5G technology. It’s working with Qualcomm to test car-to object and car-to-car communications. Others are reportedly loyal to the Wi-Fi-based DSRC (dedicated short range communications) system that dates to 1999 and is in wide use in autonomous trials and electronic toll collection. For Barrie Kirk, 5G’s power to capture information will be the selling point to automakers focused on their own next great thing. Here will be data that can be “harvested and monetized” as they evolve into mobility service providers. 5G: The G is for the generation of wireless technology. 1G was analog, 2G was digital, etc. 5G promises greater speeds and data transfer, lower latency (fewer delays) and the capacity to link multi- ple devices at once. For connected and autonomous vehicles, these are all huge. ENCQOR: Announced in March, this $400-million government-indus- try partnership will build a 5G path from Waterloo, Ont., to Quebec City. An estimated 1,000 businesses along the route — including those working on autonomous transport — will be able to tap into research and technology. ENCQOR stands for Evolution of Networked Services through a Corridor in Quebec and Ontario. C-V2X: Cellular Vehicle to Everything is an emerging technology that will be incorporated in 5G networks to link vehicles by shortwave sig- nal to other cars, traffic lights, and even pedestrians and cyclists. The wireless industry is pushing to make C-V2X the transportation standard. in new cars, and the system remains favoured by some automakers. General Motors began installing DSRC in the Cadillac CTS in 2017. The system could survive in parallel use with C-V2X.